Elia Association » Our Moderators are ready for action in Sicily! Our Moderators are ready for action in Sicily! ND Focus – Elia’s networking days for Executives is about getting the benefit of the extensive knowledge and direct personal experience of dynamic expert moderators. Our moderators for both tracks will present each session, provide background information such as research, case studies and more to inspire conversation and facilitate thought-provoking and unscripted discussion and interactivity. Track 1: TRANSLATION INDUSTRY: DOES ONE SIZE FIT ALL? Learn more about the moderators and register today! View the ND Focus – Elia’s networking days for Executives conference and business retreat agenda for the full description of each track. Early Bird registration will be open until Tuesday, 11 April 2018. Make sure you register now to take advantage of the best rates. Special rates are available for Elia Association Partners: AATC, ALC, ANETI, ATC, Federlingue and Translated in Argentina. 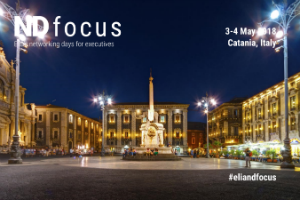 As soon as you register, please also book your accommodation at the beautiful Romano Palace Luxury Hotel, the hotel venue for ND Focus – Elia’s networking days for Executives. A palace just for us! It’s not business – it’s personal!